Seller said sell!! 20,000 price reduction on this new home, under builder price. 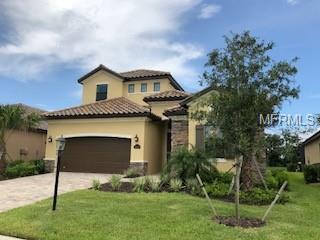 Come and see this brand new home in Lakewood Ranch newest golf community Lakewood National. Here you will walk through the 8 ft doors to the beautiful Catalina floor plan, with amazing views overlooking the water and golf course this is the perfect home. Enter the foyer to this grand home and find 3 bedrooms, a den with closet , upstairs bonus room with full bathroom and wet bar perfect for a theater room. In the kitchen you will find a large island, stainless steel gas appliances, walk in pantry, open floor plan to living and dinning room perfect home for entertaining family and friends. From the living room you can open up the sliding doors to a beautiful pool and hot tub over looking the water as the sunsets behind the pool. Outside kitchen with tile vent and granite counters tops. This home has all the upgrades from wood closet and pantry shelving to granite throughout, crown molding, diagonal 20" designer tile, and more.